Diocles! Your name reverberates through the ages—Gaius Diocles of the Red Faction. 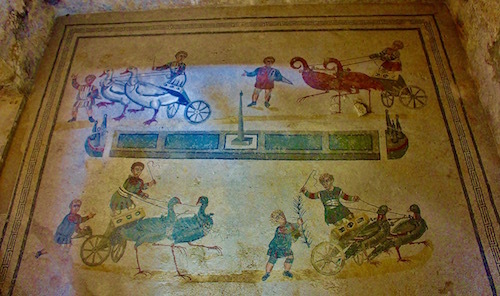 There were four racing stables, factiones, in Rome—the Blue Team, the Red Team, the White team and the Green Team, colors inspired by the four seasons. 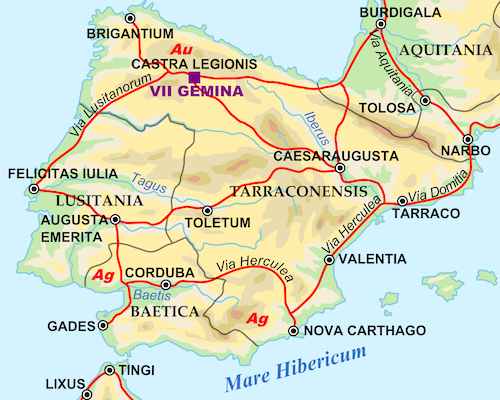 Many of the drivers, like Diocles, were from the Lusitania area (today in Portugal and Spain) in Spain, home to most of the stud farms that bred the best race horses. 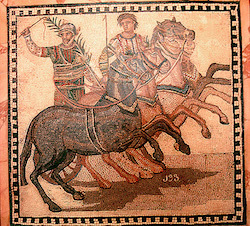 CLICK HERE for article on famous horses in Rome’s chariot races. 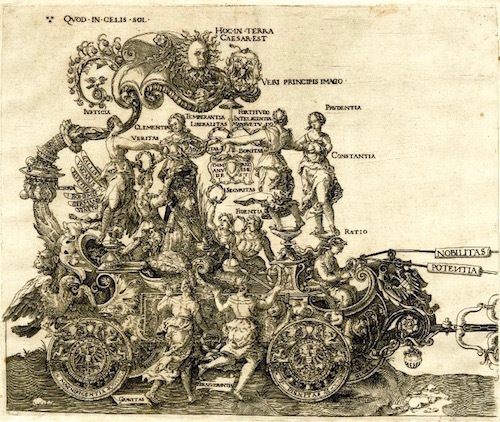 The number of horses hitched to a chariot seems to vary. 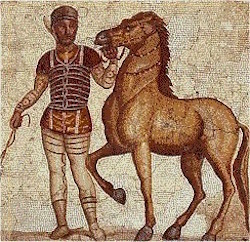 The usual number was a four-horse chariot, but in Diocles’ monument it mentions he rode two-horse, three-horse, four-horse, six-horse and seven-horse chariots. 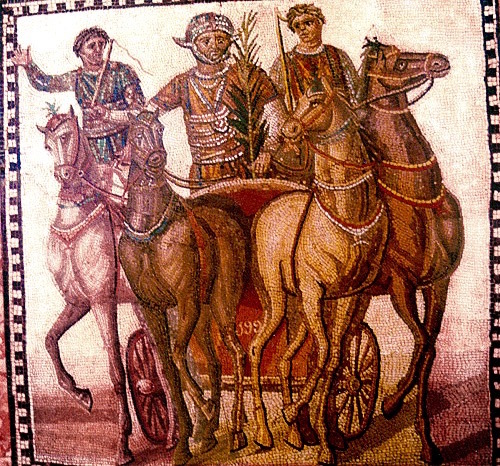 Because Diocles became fabulously wealthy, he often entered races that yielded the most money, like the unwieldy six and seven-horse chariot races. [Below is 20th century example of a six-horse hitch from an Omaha Stockyard race in the Phillipsburg Rodeo in 1931]. There is an amusing ancient painting on the vestibule floor of a villa in Sicily (see below). It fancifully paints the four racing Factions with children driving birds accompanied by children beckoning them on to victory. The Green Team wins! One would like to think the parents were honoring their children’s enthusiasm for chariot races. There were twelve starting gates at a Roman chariot race. When a white flag was dropped, the gates sprung open and the race began. Each race consisted of seven lapses around the track from start to finish. It was run in nine to ten minutes as is the famous chariot race in the movie Ben Hur. CLICK HERE to watch the 10 minute chariot race from Ben Hur. 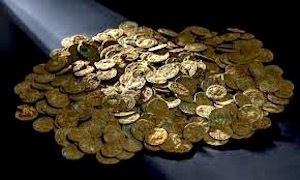 It is difficult to calculate what Diocles’ lifetime winnings would be in dollars or in any modern currency. Some have estimated his fortune as high as 10-50 billion which would make Diocles the highest paid athlete in history, for sure. However, let us put his financial assets in perspective. 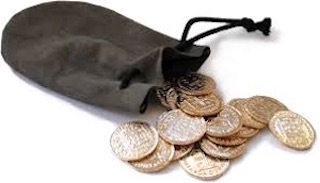 The common Roman soldier was paid 900 sesterces a year before deductions. A person was considered wealthy if his property totaled 400,000 sesterces. 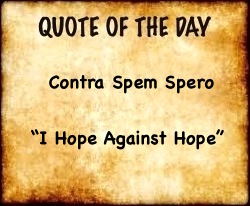 In order to be a senator, a man had to own property worth 1,000,000 sesterces. 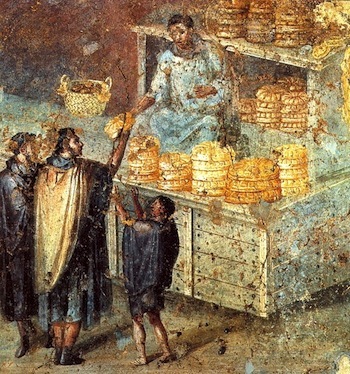 Diocles’ almost 36 million sesterces could have provided grain for the entire population of Rome for one year! Diocles’ 35,863,120 sesterces definitely put him in a class all by himself no matter how one calculates.